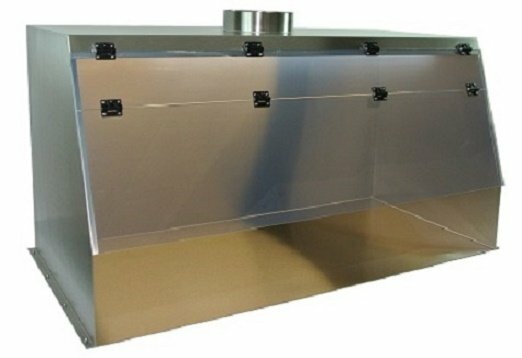 Cleatech Stainless steel fume hoods with duct port fabricated of grade 304 stainless steel with finish number 4, They have good resistance to a wide range of chemicals and excellent moisture and heat resistance. They can be decontaminated and cleaned easily and they are ESD safe suitable for electro static sensitive applications if their body connected to building grounding. The sash is static dissipative PVC and work surface is removable. You may buy it with or without exhaust fan and work surface. Primarily functions are to provide personnel protection against toxic fumes, vapors and dust but is not compatible with some type of acids. They may be corroded when exposed to vapors from hydrochloric and nitric acids. We also offer custom made chemical hood in grade 316 stainless steel that can be used for perchloric acid fume hoods. Note: If ordered with blower model not recommended for corrosive fumes. 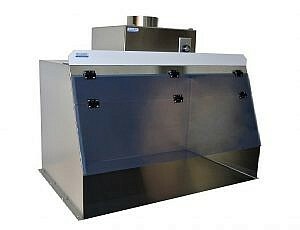 Up to two duct ports /fan modules can be ordered for the fume hoods depends on the width of hood. Blower Module: Adjustable Speed, Backward curved impeller 480-CFM, Permanently lubricated, Automatic reset thermal overload protection, 120VAC, 60Hz, Stainless Steel Housing.